LAUNCHING AS SOON AS I WRITE IT!!! 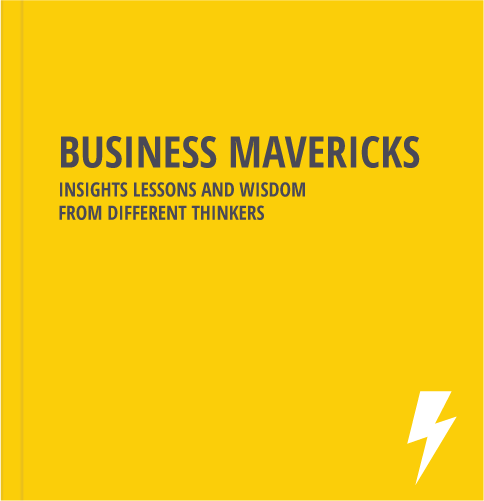 Business Mavericks shares stories and distilled insights from the widest cohort of Maverick innovators to date. Over 100 hours of interviews with 99 gamechangers disrupting their industries in their own unique ways. Soren Holm, who’s the biggest kid I know [not surprisingly he’s VP of Future Labs LEGO]. Rana El Kaliouby, whose research into how facial coding technologies can ease autism spectrum disorders became the basis for an automated facial expression recognition technology. Shubendhu Sharma, an eco-entrepreneur, who merged his knowledge of KPI’s from working at Toyota to growing 100 year old native forests in 4 years. Pamela Grossman, Getty Images Lean In Collection team who changed the way the world saw women; by creating a library of images devoted to the powerful depiction of women, girls and the people who support them. The big data is out there about Mavericks. The thick data curated are the stories the Mavericks share of their lives, why they approach business like they do, what success looks like to them and the challenges they’ve faced along the way to name a few. Stories we can all learn from. “I LOVE that you’re doing this!